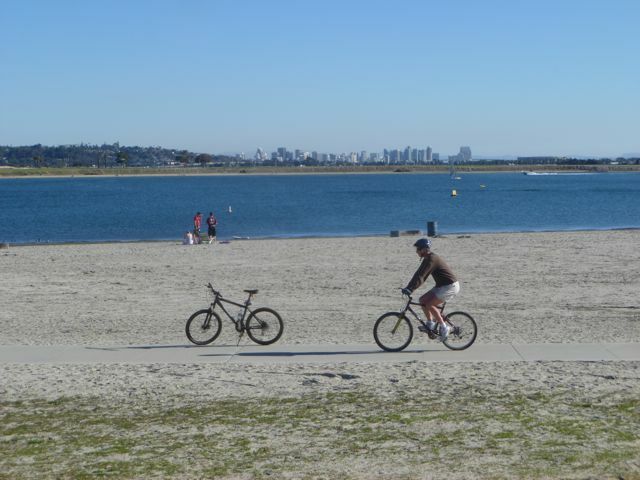 San Diego’s Mission Bay, once a wetland that was dredged to create a water playground surrounded by public parks, is nirvana for those who like easy and scenic bike rides. Trails that surround most of it are mainly flat as a pancake and hug the bay, with a connection to the 3-mile long Ocean Front Walk that parallels the blue pacific. 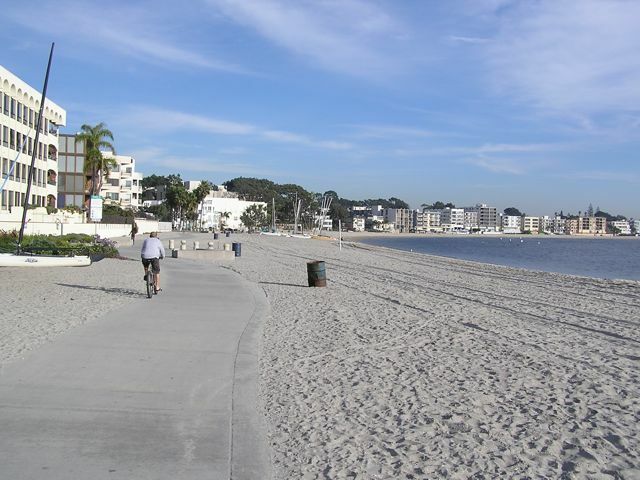 Currently two large campgrounds, Mission Bay RV Resort and Campland-On-the Bay provide a great base for exploration, and resort hotels along the route include Hilton San Diego, Paradise Point Resort on Vacation Island, Hyatt Regency Mission Bay, and Catamaran Resort in Pacific Beach. 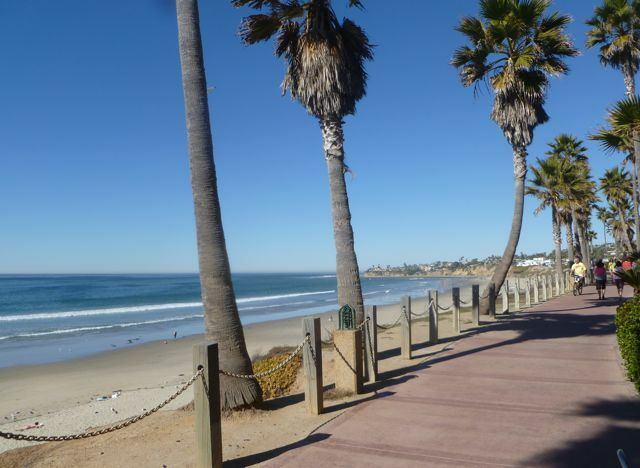 There are countless options to stop for a Bike ‘n Brunch experience in Mission Beach and Pacific Beach, numerous places to rent bikes, and trail connections that lead to area highlights such as Ocean Beach, historic Old Town San Diego, and Sea World. 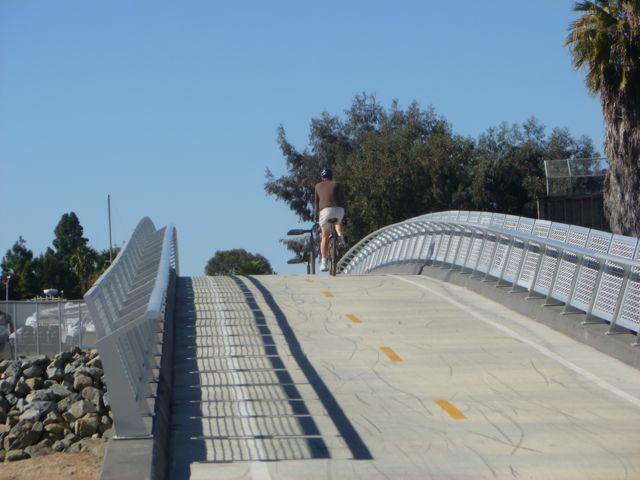 A nice loop route on side streets connects Mission Bay to the lovely La Jolla district, and you can even ride down to the San Diego Harbor trails and take a ferry to Coronado for more great riding, but that’s the subject of another story. Route signage is just so-so on the routes, so you’ll need a good bike map such as that found in enCYCLEpedia to avoid getting lost. Also be aware that doing a complete loop around the bay involves some low-traffic street riding, and crossing a bridge in a bike lane or sidewalk. Check out my entry on this topic in the San Diego Reader’s travel article contest of April 2015 (It was one of the finalists). Also see their Facebook page. Cycling around the north end of Mission Bay with the San Diego skyline in the distance. Parallel trails at the southeast corner of Mission Bay. 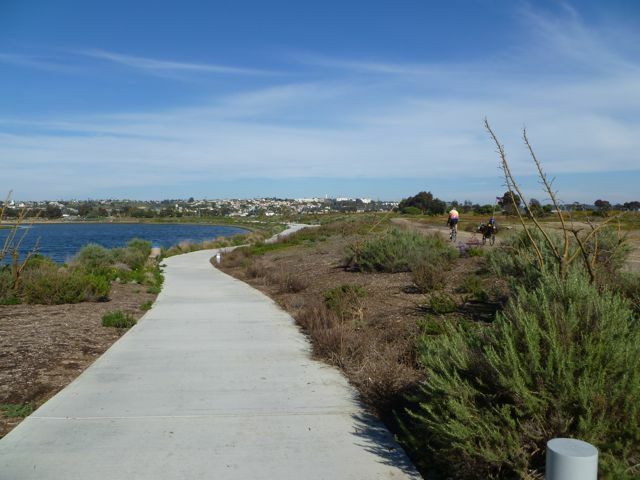 A great trail curves around the northwest corner of MIssion Bay. The Mike Gotch bridge (2012) over Rose Creek at the northeast corner of the bay vastly improved the loop ride. 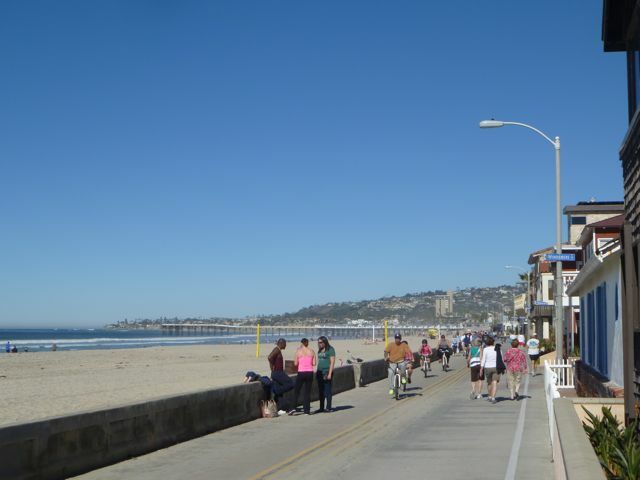 Ocean Front Walk can be a fabulous 3 mile cruise if you avoid peak times when it can be a zoo. Scenic north end of Ocean Front Walk. 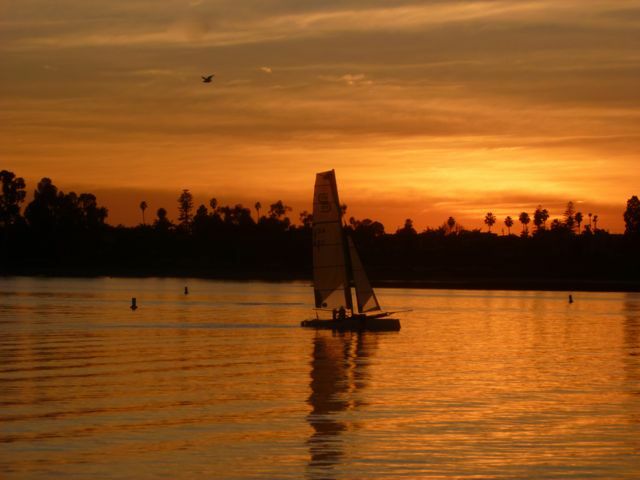 A sunset scene from Mission Bay.